Hearing loss, reduced hearing, deafness, and plugged ears are common symptoms of anxiety that can be experienced in a number of ways and can vary from person to person. The hearing loss, reduced hearing, and deafness in the ear can persistently affect one ear only, can affect both ears, can shift back and forth between ears, and can affect one or both over and over again. This hearing loss, reduced hearing, and deafness in the ear can come and go rarely, occur frequently, or persist indefinitely. For example, you might experience plugged, hearing loss, or deafness once in a while and not that often, have it off and on, or have hearing loss all the time. Hearing loss or deafness in the ear can precede, accompany, or follow an escalation of other anxiety sensations and symptoms, or occur by itself. Hearing loss or deafness in the ear can precede, accompany, or follow an episode of nervousness, anxiety, fear, and elevated stress, or occur ‘out of the blue’ and for no apparent reason. Hearing loss or deafness in the ear can range in intensity from slight, to moderate, to severe. It can also come in waves where you can hardly hear one moment and then be able to hear again next. This hearing loss symptom can change from day to day, and/or from moment to moment. Many anxious people become concerned about this symptom because of its impact on a normal lifestyle and activities. Hearing loss can be so severe that a reduction or loss of hearing is detected on a hearing test. Hearing loss is often accompanied by “ringing in the ears” symptoms. What causes anxiety hearing loss and deafness in the ear? 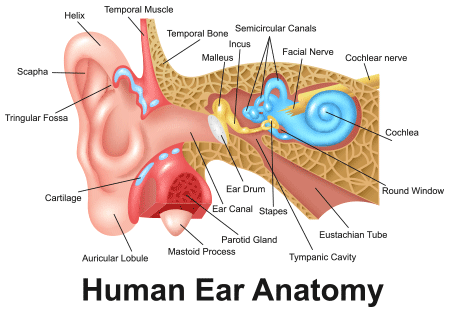 The ear, an organ, is comprised of a complex system of nerves, muscles, bones, and pressure that is intricately organized to provide sound and balance information to the brain. Because of its complexity, diagnosing ear-related problems can be difficult. For example, there can be many causes of this symptom, such as exposure to loud sounds, age, injury to the ear, ear wax build up, an adverse reaction to medication, high blood pressure, sinus or ear infection, and a variety of other medical causes. Because of the many causes, it’s best to discuss this symptom with your doctor to rule out a medical cause. Stress is another common cause of feeling like one or both ears have experienced hearing loss. The body uses its many sensory systems to process sensory information. A sensory system, which is a part of the nervous system, consists of sensory receptors, neural pathways, and parts of the brain involved in processing sensory information. Commonly recognized sensory systems include vision, hearing, touch, taste, smell, and balance. When the body is healthy, working normally, and not overly stressed, the body's sensory systems perform normally and provide a wide range of normal sensory information - sight, sound, touch, taste, smell, and balance. This can change, however, when the body becomes chronically stressed. Heightens our senses (reception, transmission, and processing of sensory information) so we can perceive and react to danger more readily. Increases neuronal activity in certain parts of the nervous system so we can respond to danger appropriately – to either fight or flee. The stress response also affects our ears in a specific way. When we’re in a high stress/high danger situation, the brain works hard to give us only the information it deems important to our survival. Consequently priority is given to visual information over auditory information, which is called the McGurk Effect: what you see overrides what you hear. While all senses are put on high alert when in danger, hearing is the least important, and is in fact, suppressed to a degree. This is called “auditory exclusion.” As stress increases, hearing diminishes. When stress responses are triggered infrequently, the body can recover relatively quickly from the physiological, psychological, and emotional changes the stress response brings about. Consequently, the changes in sensory perception are often barely noticeable. Moreover, because the changes are often sudden and end quickly, they don’t overly tax the sensory systems so they can return to normal functioning relatively quickly. When stress responses occur too frequently and/or dramatically, however, such as from overly apprehensive behavior, the body has a more difficult time recovering, which can result in the body remaining in a state of semi stress response readiness that we call “stress-response hyperstimulation” since stress hormones are stimulants (also often referred to as "hyperarousal"). Hyperstimulation can keep emergency readiness preparations somewhat active even though we’re no longer in immediate danger. Therefore, chronic stress can cause chronic hearing problems, such as all of those associated with this symptom. Furthermore, chronically engaged sensory systems can cause all sorts of anomalies that affect one, many, or all of our senses and how the brain processes them. The more hyperstimulated the body becomes, the more effect it has on the body’s sensory systems. Since each body is somewhat chemically unique, hyperstimulation can uniquely affect each person. For example, one person might experience one or two sensory symptoms due to hyperstimulation whereas another might experience a wide range of sensory symptoms. Consequently, experiencing hearing loss in one and/or both ears can be caused by chronic stress, including the stress caused by overly apprehensive behavior. I (Jim Folk) experienced this symptom, too, and in a wide variety of ways when I was struggling with anxiety disorder. Sometimes one ear was affected and sometimes both were affected. I also had a friend who experienced this symptom. Whenever he was under stress, he would lose the hearing in one of his ears. Sometimes the loss was quite dramatic. As soon as his stress diminished, his hearing returned to normal. Chronic stress is a common cause of hearing loss. How to get rid of the hearing loss and deafness in the ear anxiety symptom? When stress, including the stress caused by anxiety, causes hearing loss and deafness in the ear symptoms, it needn’t be a cause for concern or worry. Since it is just a symptom of chronic stress, it will disappear when you’ve eliminated your body’s unhealthy stress. As your body's stress returns to a healthy level, symptoms of stress subside, including the hearing loss, reduced hearing, and deafness in the ear anxiety symptom. And many more. Chapter 14 in the Recovery Support has over 80 natural ways to reduce stress. Most important, however, is overcoming your issues with anxiety, since anxiety stresses the body. We have many chapters in the Recovery Support area that address ways of overcoming problematic anxiety. Nevertheless, reducing your body’s stress and giving it time to recover from the adverse effects of chronic stress will eliminate symptoms of stress, including hearing loss, reduced hearing, and deafness in the ear. Anxiety is caused by a certain style of behavior. So, no, hearing loss itself doesn’t cause anxiety. But concern about (troubled by) and worrying about (fretting over) a loss of hearing can cause anxiety since both concern and worry are examples of apprehensive behavior. Those who experience a loss of hearing can develop phobias about certain situations and circumstances that impact their ability to hear clearly. Many people also often choose to avoid situations that they have a hard time hearing in. Many with a hearing loss feel justified in their phobias and avoidance because of their physical limitations. While in most situations and circumstances, their justifications may be questionable, there are others, such as avoiding staying in hotels because of the fear of missing a fire or smoke alarm that may be warranted. If you have experienced hearing loss and are anxious about it, we recommend talking with one of our recommended anxiety disorder therapists to help you address your concerns. 1. Harvard Health Publishing. “Understanding the Stress Response.” Harvard Health Blog, Harvard Health Publishing, 1 May 2018, www.health.harvard.edu/staying-healthy/understanding-the-stress-response. 4. Justice, Nicholas J., et al. “Posttraumatic Stress Disorder-Like Induction Elevates β-Amyloid Levels, Which Directly Activates Corticotropin-Releasing Factor Neurons to Exacerbate Stress Responses.” Journal of Neuroscience, Society for Neuroscience, 11 Feb. 2015, www.jneurosci.org/content/35/6/2612. 6. Gasaway, Rich. “Understanding Stress - Part 6: Auditory Exclusion.” Situational Awareness Matters!™, 22 Feb. 2019, www.samatters.com/understanding-stress-part-6-auditory-exclusion/. anxietycentre.com: Information, support, and coaching/counseling/therapy for problematic anxiety and its sensations and symptoms, including the anxiety symptom Hearing Loss, Reduced Hearing, Deafness Anxiety Symptom.